This post provides the basic explanation and knowledge of why you have to implement sales solutions based on advanced technologies to stay ahead of curve. Wholesale Distribution is in an inflection point, and there is enough qualitative and quantitative evidence for this claim. Those who embrace change and transform rapidly will thrive, while those stuck the old ways of evolutionary change will be remembered as a textbook example of what not to do. As are the likes of Blockbuster, Kodak, Sears – and many others. We will explain the place of advanced technology and Artificial Intelligence (*AI) in the modern B2B field sales world, and how this fairly new, emerging technology can help you improve your business today and set you on the course for success. Learn about the biggest concerns wholesalers and distributors face in this day and age. Imagine you are a retailer, now go back 20 years and try to order a product directly from a manufacturer. You would come across so many obstacles which would render this impossible. This is where the wholesaler steps in. As an intermediate between retailers and manufacturers. It has been like that as far as we know. However, this is changing. Technology has enabled retailers to skip wholesalers and go to manufacturers directly through their digital platform. Not only that retail does not need wholesale, but the manufacturers don’t need retail as much, as they can also sell more goods directly to end users with higher profit margins. We saw this in action when one leading medical supplies distributor recently lost a $525M contract , because the integrated health network the distributor supplied switched to self-distribution. Although technology presented itself as a problem for wholesale, it can also act as a solution. More on that below. Wholesale distribution is an industry dominated by older employees. An average employee in the industry is 43 years old, while ⅓ of the workforce is over the age of 55, and more than 20% are going to be retired in the next 5 years1. What this means is that distributors face the challenge of building an attractive work environment for a younger workforce. Why would someone want to work in a lagging industry and limit their career opportunities in the future? The good news is that more and more distributors are realizing this. Karen Lynch, provided some insights on the topic. 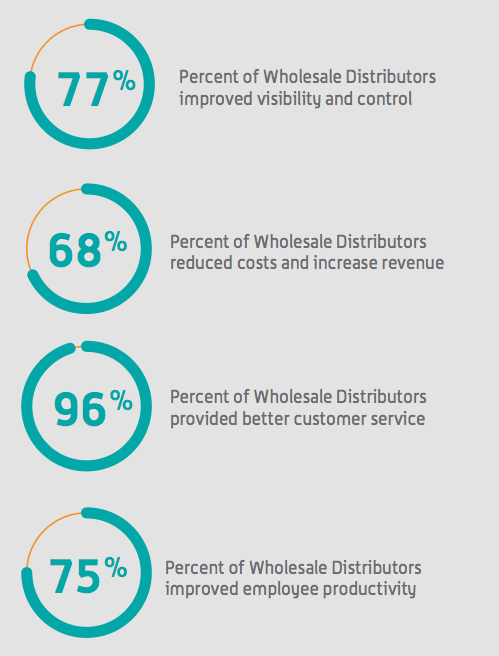 Research shows that 90% of wholesale distributors are currently using ERP systems, while 82% implement automation. And these systems can provide even more benefits when improved with advanced technology. The main business concern among wholesale trade and distribution industry is how to increase revenue while improving base profitability. Well how is this different from any other industry? Don’t forget that the number one pain point in the industry is low-growth environment sprinkled with ever decreasing margins. 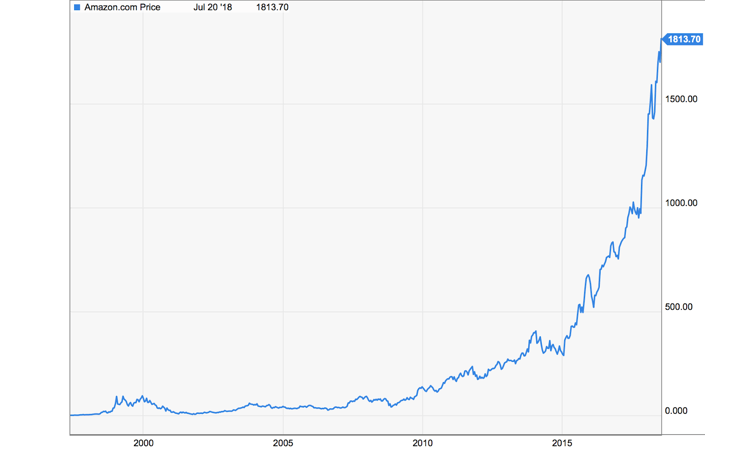 So, how do these companies plan on growing revenue? Productivity. 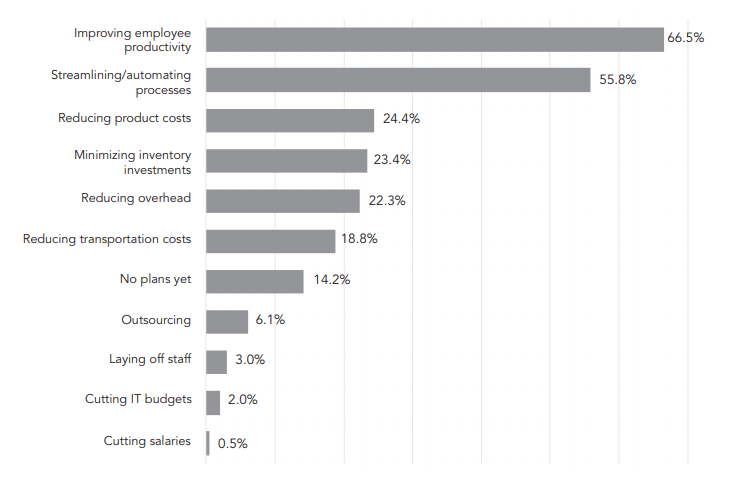 According to The Outlook for Wholesale Distribution in 2017 almost 60% plan to grow revenue by improving current employee productivity, which basically means selling more to existing or new clients with the same number of sales reps.
What this also means is putting huge pressure on sales teams. It can be done, but only with the right tools for the modern age. What are the current practices in solving wholesale and distribution industry challenges? All those challenges have one comprehensive solution – technology. The secret to technology is not just talking about it, but actually using it. Solutions, apps and tools based on advanced and modern technology are the key. Now we are talking about ERP systems, CRM, order management and mobile ordering tools, automated billing, route planning and other sales tools which provide advanced solutions. But are these solutions really effective? And we are not talking about some technology which can do everything, but can’t leave the lab. All these solutions can be improved – today. Let’s take a closer look at “modern solutions” first. B2B sales in wholesale trade are still dominated by field sales. When we observe how field sales representatives go about their day we can tell it has not changed much over the years. They go out of the office, meet with clients, present company’s products and services, fill up the orders. Route planning helps them optimize their travel plans and saves their time, interactive catalogs makes presentations easier, while ordering apps simplify the ordering process. 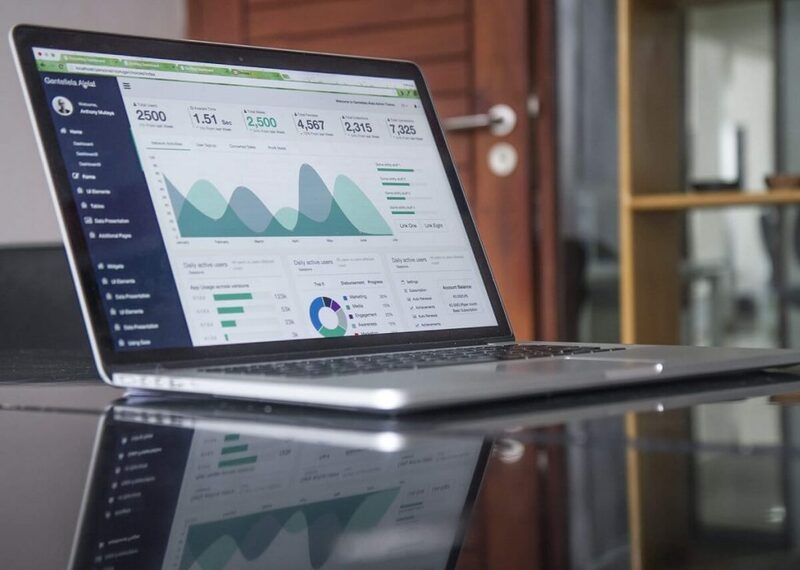 Of course, we cannot omit business solutions like CRM and mobile CRM which provide a platform for understanding sales rep performance, analyze assortment and measure overall success. Many platforms work great individually, but there has to be a comprehensive solution which can generate true knowledge across the organization and truly empower decision makers without the need for constant additional analytics done by hand. Technology powered solutions show valuable information, but they only do that. You still need an experienced person to interpret data and provide instructions for single sales members, and managers. What if there was a sales solution which would tell sales reps exactly what to sell, when to sell it and to whom? Majority of the mobile solutions for wholesale trade and field sales in particular are not designed by the experts in this field. You get a solution with properties thought to be good for you instead of those which are proven to work. Most of the tools operate independently, disconnected from the bigger picture in the organization. What if you could bring all the tools together, between all the different ERPs, systems and teams. Having various tools is beneficial, but having a Swiss knife provides much more value. At the moment there are various solutions for individual sales channels, but the wholesale trade and distribution industry lacks a platform which covers all sales channels, spanning across field sales, telesales, channel sales and online sales. The secret to significantly increase productivity and sales in wholesale trade and distribution is to look for more than existing descriptive and simple mobile ordering solutions. Sales solutions based on advanced technologies of the past do not have the capacity to surge productivity to the necessary level. As many wholesale teams need between 20 – 100% productivity jump for bypassing ever dropping margins. What companies in the industry have to look for is a solution which incorporates all that is missing from the mentioned tools. A solution based on technologies of the future like Artificial Intelligence and Machine Learning. What is the Future of Wholesale Trade? The main issue with current sales solutions is they only provide information and lack the power to steer sales representatives in day and age where AI and Machine Learning take over many industries. Aside from being buzzwords, AI and ML are the foundation of the most valuable companies today. Google, Facebook, Apple, Microsoft, and the fifth horsemen – Amazon, have been working on AI and Machine Learning solutions for years, and continue to improve them everyday. Artificial Intelligence aims to create machines which have reason and problem solving skills. Sales solutions based on AI can efficiently help support decision making, empower and steer sales representatives so they know what, when and how to sell. Most importantly, sales solutions using AI implement problem solving and knowledge growth on a scale incomprehensible by humans. If you are a wholesaler this is the moment where you have to make a choice. Continue using solutions based on antiqued technology, or start implementing a wholesale platform based on the technology of the future and get a leg up on the competition. This is not an over exaggeration, the theme of this year’s annual executive NAW summit in Washington DC was “Transform or Be Left Behind”. Paul Pretko, Wholesale Distribution Advisor at SAP observed. This is why we built Intelisale on top of AI processes and elements, especially ones focused on decision making – business intelligence. In a single solution, we also align all your processes like mobile ordering and approval processes, mobile CRM, route planning and much more. Intelisale experts have been a part of the wholesale trade and field sales for more than 20 years. Here are their recommendations on why to look for an AI-powered sales enablement solution and how it can support your organization’s’ productivity. All of the logic described below had led us to developing Intelisale. What are the Elements of an advanced sales solution? Here are a few elements you should be looking into when choosing the best sales solution for your B2B wholesale business. A mobile ordering app can replace your papers and excel sheets and make your sales team look more professional, but that is just beating around the bush. Replacing your paper catalogue does not bring strategic level effects. If a solution is using data from your ERP system it doesn’t mean it has the right logic on how to use that data. The logic should be implemented within the technology of the solution – only machine learning logic can tackle with advanced and complicated requests, interconnecting hundreds of different data points in a way that is fully customizable. Simple excel tables and digital catalogs can do so many tricks, but we are already beyond these simple tricks. Corporations that rely their decision on instant, interconnected and deep data will be the one to sit on the throne as the industry leaders. Sales solutions based on AI and advanced technology will prompt your productivity, give you the knowledge to decide in minutes, drive transparency and cooperation within the organization, and consolidate all functions and lead productivity forward, making you able to tackle all challenges. AI-based solutions will make a rockstar out of your sales rep regardless of time spent in the organization and whether you have 300 or 30.000 customers or trying to sell between 1 – 1.00.000 SKUs. How an AI-based sales platform guides the sales process? all based on 50 various data points. The same logic should apply for different sales channels like field sales, telesales, channel sales and online sales. Not every solution needs to be connected to your ERP in order to work. Platforms which use data points like excel are simple, however they lack the sinergy from your organization’s know-how. An intelligent sales solution needs to learn from your data, all of it. It uses ERP as a source for growing your organization’s knowledge tree to a giant sequoia with machine learning. It identifies patterns in observed data, builds models and predicts things without the need to pre-programme it. With the right B2B sales tool you will be able to track real-time results, across the teams and functions, no matter the territory; across the product lines, products types, price points, margins. The solution has to be powerful enough to give you the right insight in a split of a second, in real time, simple to understand and to be interactive – enabling data points to communicate with each other and suggest conclusions for you. A truly intelligent solution is one which adapts to your needs, not vice-versa. Choose the solution that is customizable, can integrate with any ERP, as easy as possible and does not require any changes to your current IT infrastructure. 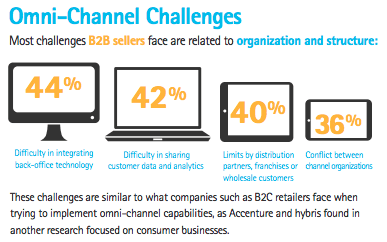 Omni-channel sales is one of the fastest growing B2B trends. Study done by Forester Consulting provides many valuable insights about implementing Omni-Channel strategy in B2B sector, among others are the main challenges B2B sellers face with implementing it. Look for B2B sales solutions which support all your sales channels. The best way to boost your productivity is if you have one solution that empowers your current field sales and telesales and helps you create, enhance and grow your online sales. If you settle for a simple solution that cannot support all of your sales channels in the same way, you will be losing a lot of precious time and money. We at Intelisale believe sales solutions based on modern technologies are not the future but the present, and we are already helping our partners achieve great results around the globe with our omni-channel sales solution. If you wait for everyone else to implement advanced technology sales solutions before doing the same you will be shutting the stable door long after the horse has bolted.